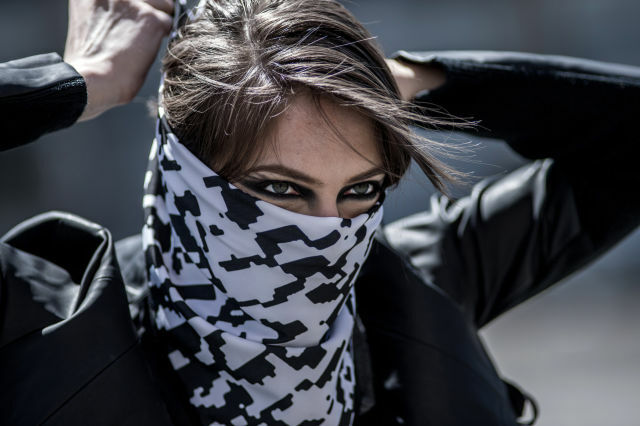 A black-and-white bandanna printed with a blocky, digital pattern reminiscent of the common Arabic keffiyeh is one item in the Backslash kit, a package of devices that help protesters stay safe and connected during demonstrations. The bandanna's pattern can store messages that can be revealed with the Backslash app. When riot police descended on protesters in Ferguson, Missouri, last year sporting assault rifles and armored vehicles, the images sparked an awareness of the military technologies and tactics authorities have adopted over the past decade. Many of these tools have quietly become regular components of day-to-day policing. And just as with social networks and cell phone cameras during the Arab Spring and Occupy Wall Street, they've dramatically—and often invisibly—altered the dynamics of contemporary protest. Examples are everywhere, from the controversial Long-Range Acoustic Device (LRAD) sound weapons used to disperse crowds to secretive mass surveillance devices, commonly known as stingrays originally developed for the US Navy, which police use to track cell phones, often without a warrant. Earlier this year, police in India began equipping aerial drones with pepper spray cannons to use on crowds of protesters. In August, North Dakota became the first US state to allow the same; a new law drafted by a drone lobbyist permits North Dakota cops to arm drones with pepper spray, tasers, and other “less-than-lethal” weapons. The FBI has admitted that it flew surveillance planes equipped with high-resolution cameras over the Black Lives Matter protests in Ferguson and Baltimore, Maryland—part of a secret program that has monitored over 30 major cities from the skies using aircraft registered to fake companies. And in New York City, the NYPD has outfitted unmarked white vans with advanced X-ray equipment capable of seeing through walls and even people's clothes.